This is a slightly convoluted story so please bear with me but if you have any unpainted Roundway 15 mm medieval figures you don't want jump straight to the end of this post. 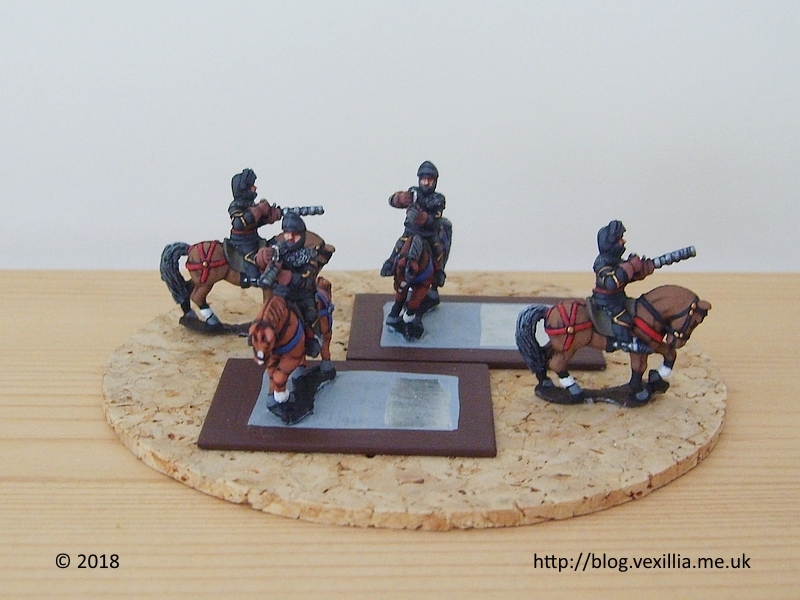 At Britcon I bought a pack of Essex MER13 late medieval mounted handgunners from Instant Armies. I bought them because I was fascinated by the depiction of a knight on horseback firing an early hand gun. As you can see they are only partly based. I wondered if I could get some other figures to give the bases a bit of variety. I remembered that Roundway do a suitable figure. At this point things got complicated. I've used Roundway figures for a number of projects as they mix well with both Essex & Donnington ranges and have a number of really useful figures. I first bought them in 2007 when I started my Islamic Persia DBA project. Over time I have learnt how best to paint them and I find that, if approached properly, they can look very good indeed. 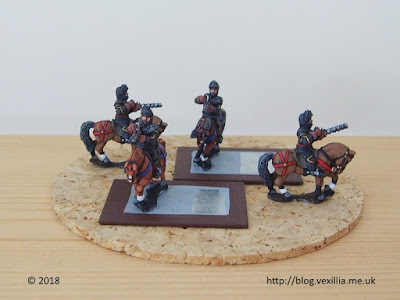 I thought of putting an order together as, in addition to the mounted hand gunners, I need some Mameluke medium infantry and some Ottoman Akinji. Then I thought I'd get some dismounted knights for my War of the Roses army and some Russian heavy cavalry while I was at it. Unfortunately, the new owner of the ranges isn't answering their email so I was wary of placing an order. I hope the business comes back to life soon. My initial email was a request for information and pictures if possible. The latter are rare and it's almost impossible to know what each code looks like if you haven't bought them before. Luckily, I remembered that Keep Wargaming had listed some packs a few years ago on their eBay shop along with good pictures. So I emailed them asking if they had any photos filed away. Within an hour I had a reply with all the photos they could find. Superb service! It got better. Shortly afterwards I received another email from Keep Wargaming saying they had found some stock they'd forgotten about and it was now on eBay. I bought five packs immediately and they arrived within 48 hours. As a typical wargamer only two packs were on my original shopping list. 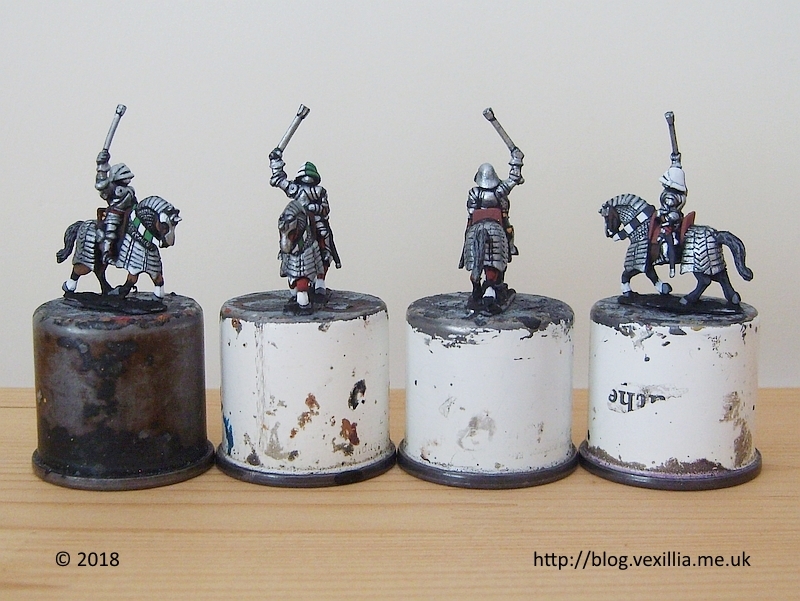 The figures are RKG02 (German Knight in Gothic Armour, Mace) and aren't varnished yet but I thought I'd record them in all their shiny glory. I went for a "white armour" look with two layers of metallic paint. The top layer was very bright indeed. I bought these because I was inspired by Tony Aguilar's French Ordonnance DBA army which I came across whilst I was looking for photos of Roundway figures: well worth a look. Now I need even more figures to go with them! Now the appeal. If you have any unpainted Roundway 15 mm medieval figures you no longer need please get in touch using the contact form in the footer and I'll make you an offer. As you can see I'm interested in all sorts. Thanks for taking a look. Send photos if you're unsure of the exact code. Thanks for the "Shout Out", Martin. I love your work.